DragonBox Numbers is a cute math game that focuses on developing intuitive “number sense” in children rather than forcing rote memorization. Since the game is designed for kids ages 4-8, starting up the game requires a parent to create a profile for the child and register by email. Once you’re in the “parent zone,” kids can choose one of several modes of play: “Puzzles”; “Sandbox,” where kids can tinker freely with the cute number characters called Nooms; and “Ladder,” where the goal is to create a certain number. Lastly, “Run” is a side-scrolling mode (meaning the screen moves on its own from left to right, forcing you to move with it) where kids slide their finger over numbers to raise/lower the Noom and collect stars and coins at different heights. 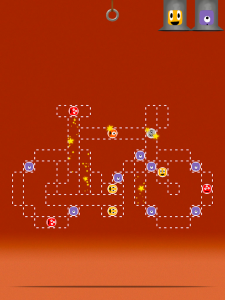 The main feature, though, is the Puzzles mode. Here, kids meet the Nooms, adorable characters that resemble sticks of different lengths. Each one has its own personality, represents a different number (one through ten), and says its name in a different voice. “One” is a hyperactive, wild little fellow, and “Three” is a little more mischievous, shouting, “Yeah, Three!” in a proud tone. Kids tap pipes at the top of the screen to send Ones and Twos flying down on the screen. The goal is to complete a pattern by creating different numbers. You can “feed” Nooms to other Nooms to add them, or slice them at different segments to break them apart (cutting a Four at the top would create a One and a Three, but slicing it in half would create two Twos). Kids then drag and drop the Nooms onto different Tetris-like spaces that require a specific-sized Noom (an Eight or a Six, for instance) to complete a picture, such as an animal or food. Kids receive coins for accomplishing this. The game’s pleasant female announcer pronounces the total (“One-hundred eighty!”) and also occasionally narrates what kids are doing as they add or subtract Nooms (“One plus one … two!”). Kids can then spend the coins just like real money to unlock new levels. 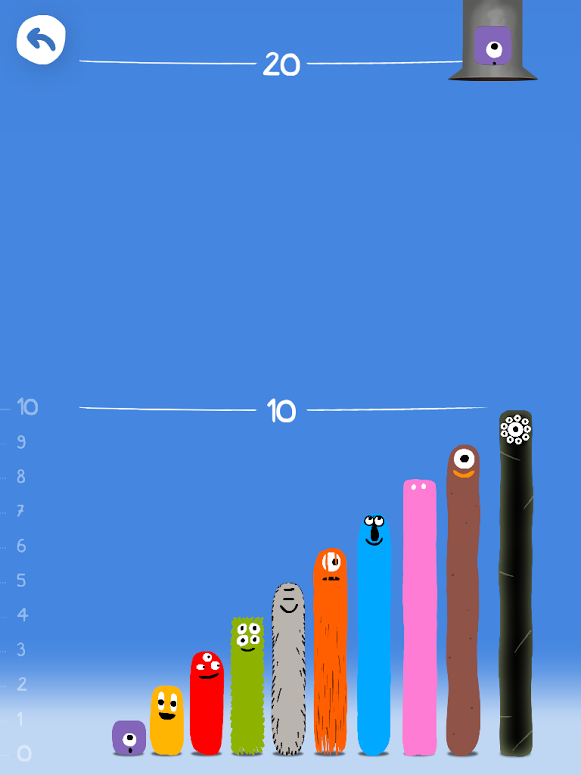 As kids progress, the game gets a little more complex: The puzzles get larger, or kids have to figure out which Noom (or number) to create based on the Noom’s face (rather than size) or by digits alone (such as 13). If kids fill in certain spots, sometimes they’ll earn stars that will shower over the puzzle, filling in other spots for them. They can also earn these stars by using their finger to trace a number when it appears onscreen as a special event. One of the nicest features of DragonBox Numbers is that it’s not enforcing “lessons” on kids. Instead, it’s allowing them to experiment with numbers on their own terms in order to do something fun: complete a picture. The game doesn’t punish kids for generating more Nooms than they need from the pipes. It doesn’t force them to create the numbers that fit on the Tetris-like spaces in a certain way. Kids can feed Nooms to other Nooms as much as they like (to add), or cut them in half to their heart’s content, or a combination of both, until they get the right number. It’s nice, too, that they aren’t forced to complete the levels in a certain order. As long as they have enough coins, they can skip around between the 30 different themes: Animals, Numbers, Vehicles, Food, Fish, Ninjas, and lots more. DragonBox develops number sense, which refers to an understanding of what numbers are, how they work and relate to one another, and how you can use them. This is an important skill because it develops flexible thinking and confidence with numbers. In the book Teaching Preschool and Kindergarten Math, authors Ann Carlyle and Brenda Mercado refer to this as making “friends with numbers”—which is exactly what kids are doing here. Because the Nooms are so lovable, and because the game is so encouraging of kids learning in their own way, DragonBox Numbers may very well foster a love of numbers. At the least, it shows kids that math isn’t just about completing questions on a worksheet. It can be a means to something fun, too, like putting together a picture of an alien. DragonBox Numbers is a good way to teach math through play for kids in lower elementary grades. It’s designed to teach kids how to count, add, and subtract without rote memorization. Instead, kids get to experiment with numbers and learn at their own pace. The app costs $8 for iOS and Android. Completing puzzles is fun, and playing with the eccentric Nooms never gets old.